Figure 1. Get Year From Date in Excel. If we have a date list which we want to extract the year from, we are going to make use of the Excel YEAR Function. The YEAR Function operates by taking one criteria, the date from which you want to extract the year, and extracts the year from it. How to use the Excel YEAR Function. We are going to demonstrate the usage of the YEAR Function in 3 simple steps. Label the columns of our worksheet and assign a blank cell for Excel to determine the year number. Figure 2. 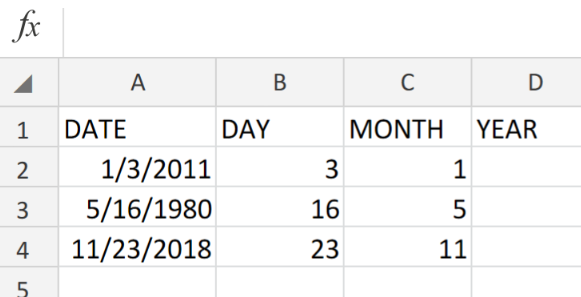 Get Year From Date in Excel. Enter the formula for the YEAR Function into the formula bar for cell D2, to generate the year number from our date list in cell A2. Figure 3. YEAR Function in Excel. Modify, copy and paste the formula in cell D2 above into the other cells in the YEAR column to get the desired results. Figure 4. YEAR Function in Excel. The dates entered in our date list have to appear in a form recognized as valid by Excel. Making use of dates in the form of text will only cause unpredictable results due to different regional date settings on our computers. I would like to show the renewal date on the renewal date column (1 year) from date paid.